Welcome to day 13 of the hop! This is the final day for bidding on my card. Bidding will close at 12 midnight tonight. I am using the Uplifting set from Skipping Stones Design. 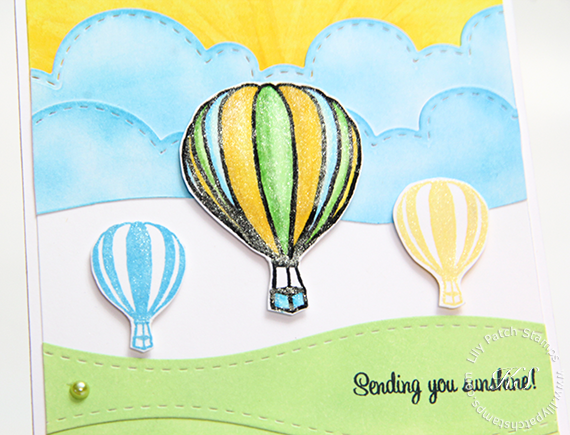 The hot air balloons are colored in using Copic markers and a layer of glitter was added for some shimmer. EVERY Single card/project along the blogs for boobies bounce is up for auction. Bidding starts at $5. Please Note IF you want to bid, and live outside the U.S. we would request that you pay the difference of shipping charges between where you live and what it would cost to ship within the US. * See how to place a bid for more detailed instructions. UPDATE: Previous bidder is at $5. Please place a bid above this amount in the comment below. Any bids not placed on the correct post will be considered invalid.